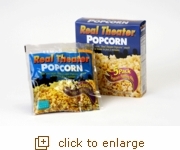 This Real Theater Popcorn kit is perfect for the movie lover in your life. This kit includes everything you need to make theater-style popcorn at home! It’s so easy to use: just put the popcorn in your Whirley Pop Popcorn Popper (or pan) and pop!